Apple's iPhone is quickly becoming the ebook reader of choice for many, and could steal market share from Amazon's Kindle, according to a report from market research firm Flurry. The iPhone and iPod Touch turned into a popular handheld gaming platform over the last year, as most of the apps released for the devices were in the games category. Even Nintendo acknowledged that iPhone games were among the reasons its DS portable gaming machine under-performed in sales. And now it appears it is the Amazon Kindle's turn to take a beating, as book applications for iPhone exceeded the popularity of games apps in the last four months, according the Flurry report. In September, iPhone books (some running on Kindle for iPhone) overtook games for the first time, while one in every five new apps in the App Store in October were books. 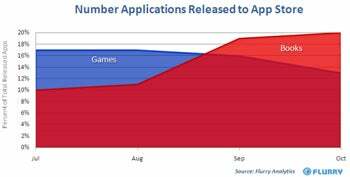 Flurry's chart below shows a surge in book apps for iPhone releases from July to October, with book apps overtaking game releases in September. The analytics firm predicts that Apple could steal market share from Amazon's Kindle, as more publishers release new book apps for the iPhone at "record rates." Amazon did not disclose how many Kindle units it had sold, however, Forrester research estimates that three million e-readers will be sold in the United States in 2009. There are over 57 million iPhone and iPod Touch users worldwide. The Kindle is vastly outnumbered by Apple's touchscreen devices, despite the iPhone having a significantly smaller screen than Amazon's Kindle (6 inches). This makes the iPhone platform a larger gateway for book publishers. Apple's widely speculated upcoming tablet, yet unconfirmed, could also pose a future threat for the already crowded ebook reader market by the likes of Amazon, Barnes & Noble, and Sony.